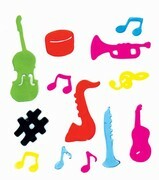 Eleven plastic thermo formed multi-colored music symbols that will stick on any smooth surface. These non-toxic three-dimensional stickees will not leave any residue and are great for refrigerator, wall or window applications. Size varies 1" - 3"W. Header poly pack 1.5" w x 10.5"H . Easy to wash in dishwasher liquid, rinse, dry and re-apply!